“My task on the Sunday was to examine the Sunday Schools Meeting at Nantyr, but instead of the question and answer session it was far easier to turn it all into a prayer-meeting. I was to be there all day, but I felt a voice calling me to go down to Glynceiriog that evening. I didn’t know why, but that Sabbath evening a man gave himself to the Lord". The revival narrative can be a deceptive trail. Leading the reader upon the path of seeking out the spectacular based upon the size of crowd or breathtaking signs. It is true to say, those tales are true. But they don’t tell the whole story. One of the most beautiful tones within this symphony of diverse notes, is the sound of the individual. Not from a sense of selfish want or egotistical focus, but from a sense of heaven’s concern upon the ‘one’. In amongst the noise of many, there is a act of love being played out that goes beyond the constraints of our imagination. Where God’s Hand orchestrates a movement of people, expressing love’s embrace in a way that values the mundane actions of our lives. In amongst the crazy noise of the Welsh 1904 revival, where the spectacular took its place upon the stage of our attention. There were a series of notes underpinning the song being sung. Where characters like Ellis Jones, who simply followed the prompting of his heart and walked the one-hour journey to another town. There he found a man who needed help. It wasn’t a crowd of conversations. It didn’t make the headline news. But it did bring praise into the very heart of heaven. Yes, revival can have the razzmatazz of the loud and dramatic. But we are ‘less’, if we build our hopes around that. Revival is about something more. And maybe, to discover it, means that we begin at the beginning. Love for God. Love for one another. Love outplayed in the mundane and dramatic. Each action playing a crucial part. Each action contributing to the other. Each action reliant upon the whole. Love. It’s an intricate narrative, whose lines we can so easily miss. Imagine the scene of a small, cross-eyed, theatrical preacher making his way towards a Bristol village in 1739. A village that was infamous for violent protest towards oppressive business practices. Due to the minimal voice of opposition from the established church concerning the treatment of workers, anyone who represented that religious structure was also considered an enemy. Depending upon the version of the story we tell, one could create an image of a powerful, spirit-led orator, by the name of George Whitefield, who captivated a mob of protesters with the Gospel message. With each sermon given, the numbers increased. Soon the success of such a mission led to a chapel being built, and a previously unconvinced John Wesley re-evaluating his initial distrust of open air preaching - “Kingswood does not now, as a year ago, resound with cursing and blasphemy, it is no more filled with drunkenness and uncleanness… wars and fighting… Peace and love are there”. As with any narrative, there is another storyline. One I have mentioned a number of times within this blog and book 'Revival’s Symphony'. It is a storyline of unconventional preaching styles that challenged the accepted ‘way to preach’ and ‘sermon content’. An analysis of these messages delivered by the early Methodist movement, reveals a mixture of political and social commentary, embedded in an holistic declaration of salvation that would make a number of our modern, fresh expression, churches feel old. In the case of Kingswood? Whitefield’s critique and declaration of an alternative, encouraged a village revolution. This included, distribution of finance towards social services, education support and health care. It was this change, of the internal and external, that grabbed Wesley’s attention. This movement of unconventional preaching styles and choice of locations, was not unique. 18th century preachers like Daniel Rowland and Howell Harris were part of a growing voice of people who were redefining expectations through the engagement of pain within the land. No more safe pulpits or verbal call for change from a comfortable space. This was about getting your hands dirty, exposing yourself to the pain of injustice, then making your stand upon the very ground that cried out for change. One of the things that I appreciate about this amazing movement of social change, was their appreciation of the journey that led them there. Like all of us, the excitement of a breakthrough - that moment when your hope finally sees visible substance - is always valued. Whitefield, after his first sermon in Kingswood, wrote “Blessed be God that I have now broken the ice”. On one hand, a straight forward comment about being thankful for a breakthrough. Yet, placed within the context of a preacher who had faced rejection from many quarters of his faith - who had found his calling welcomed with struggles - and you begin to see another dimension to his words. Kingswood wasn’t a bolt out of the blue. It was an option considered and shaped by prayer. A consideration fuelled by the experiences of his journey thus far and by the readings he was investing in. These readings included the provocative writings of Richard Baxter. A man who challenged the pursuit of the ‘inner call’, the appreciation of diversity and its role in unity, and the importance of standing up in word and deed against social injustice. This act of standing including the declaration of an alternative. Caught within the texts, journals, and letters of this movement, is a value placed upon the highs and lows of pilgrimage. You see a conviction, sometimes shaken, but not lost, of a demand to declare an alternative. And you see an honesty in their weakness - a reality that sometimes the most mundane action, fuelled by questions, can lead to surprising results. Appreciation of our steps. Such an important value to hold onto. We may long for those ‘break the ice’ moments, those actions that capture the headlines declaring change is here. Yet I find that the beauty of our pilgrimage is one that speaks of a change that happens during the journey itself. That is where the alternative first finds voice. In the secret, in the weakness. Away from the headlines. The eyes of creation are upon us for our next move. • 70% of the UK land is Agriculture, and held by 0.28% of the population. • 20% of the land is Waste (including mountains, rivers). • 5% is Domestic which houses 90% of the population. The topic of a ’space to live’ is an important one, and it was something that came up often during my research of Quaker Capitalism. Against the flow of building trends, business practice, distribution of finance and economic guidelines, a number of Quaker communities decided to buck the trend. Within a short space of time during the Industrial Revolution, they presented to the country a different way of doing business. From employee services to health care, from social responsibility to community development, they put in practice an ethical and holistic model of living. This was over century before the emergence of the political funding buzz word of ‘social enterprise’ that we have today. With our benefit of hindsight, it is easy to critique some of their practices. Suggesting maybe a less paternal approach, something that might have prevented the problems they ran into in later years. Specifically, the disempowerment of individuals and sustainability of services. But within all these faults, their impact radically, and positively, transformed business practice and living standards for many people within inner city life. One of their radical models was around housing. Within a trend of uniform, terraced and ill-equipped accommodation, they developed an anarchic approach to architecture. In partnership with artists, they developed housing that carried individuality alongside living conditions that valued the people who were going to reside within the buildings.They recognised that what you designed spoke a lot about your own priorities and how you valued your fellow human being. Approach to space, living standards, profit first or humanity first. All these aspects, and more, revealed the secrets of the human heart. It was a gamble that didn’t make financial sense in many ways. Increased costing, increased construction times, increased land allocation for each living space. But, within all the uncertainty there was a realisation that housing and engagement with land was a contributing element towards the fulfilment of life. Their experiments and models paid off. Within a generation they proved to local and national government that a different approach to housing could effect the health, education and work ethics of individuals. The flip side, their proof and later abdication of responsibility to government structures, eventually led to a profit first approach and ideology that missed the driving force of those experiments. One driving force was the lifestyle guidelines that those Quaker communities fashioned during a time of persecution and opposition after the English Civil War. Finding themselves with limited options to survive within the economic system of the day, they developed alternative structures. An underground movement that imagined a new way of living. They articulated their hopes and dreams into practical examples, that gathered pace over time. And as persecution lessened as the years passed by, they emerged into the open with an alternative economy that was built upon an ethical framework of prophetic imagination and compassion for one another. All of this encased within an environment of honesty. A culture where truth and vulnerability reigned over spin and self interest. Sadly, that bedrock soon disappeared as success led to governmental adoption. Finance requirements, vested interests and political goals replaced some of the key aspects of that alternative movement. But, its legacy remains today with some of our garden cities and employee services. It is this legacy that leads me back to the article about housing. Something needs to change - and that change needs an alternative language to the one we currently use. Imagination framed around terminology of a system that benefits just a select few will only prove to be a glass ceiling. Something that gives an illusion of change, yet continually prevents us from really stretching towards something new. Alternatives are needed. Alternatives are present now. Yet to speak of them and to act them out, then challengingly, they demand an imagination that doesn’t make sense to our current ways of doing things. Exciting opportunities? Fearful opportunities? Unwanted opportunities? A recent episode of BBC Panorama highlighted another dimension of the housing debate. Another news story hits our press today about a utility company and their price increase. When our energy structure is based upon the primary goal of shareholder wealth, these stories will continue regardless of the rationale for any increase. Some sixty years ago a large majority of the Birmingham City Council were non-progressive. There were no parks, no free libraries, and only one bath. The gas and water undertakings were monopolies carried on for private gain. This state of things were absolutely changed in a very few years…. In a short space of time, an eclectic group of people fleshed out practical ways of operating business that was founded upon a land of equality and ethical lifestyle. Where the appreciation of creations resource was not based upon selfish gain or shareholder wealth, but the value of the 'common good'. Not all their models worked, but they did bring the alternative economy of the ‘impossible and unseen’ into vivid reality; pointing to the achievable possibility of doing something differently... for the better. Yes, another news story takes its headline moment. And yes, another vivid reminder that our pilgrimage of faith is one of prophetic imagination, where our steps craft out a different kingdom which is slowly but surely emerging into reality. The debate continues concerning Labours plan to tackle energy prices. For some, the idea of addressing a market that seems out of control carries weight and ethical purpose. For others, the concern that an approach like this could lead to economic struggle and limited energy availability, produces further evidence to rethink. Regardless the side of the debate one sits, I am mindful of an argument that found momentum in the 18th and 19th century from a band of radical and creative thinkers called ‘The Quakers’, that dared approach this topic - but from a different angle. Utilities and energy are deeply linked to creation. Creation, amongst other things, is God’s gift to humanity / life. This gift must not be abused but be respectfully approached as an act of worshipful living. Utilities and energy is for the support of creation, specifically humanity - and thus, must not be controlled or dominated by a select few. To harness this resource, frameworks can be put in place that carry collective ownership yet also embody business values of sustainability and investment. These frameworks must not be owned by shareholder wealth, but any profit from income, subscriptions, bills should be 100% invested back into the ‘betterment’ of the service to support all. No one should be without this resource due to financial demand - it is immoral and contrary to this gift. They presented a number of different models, practising these values through a series of business ventures that some call ‘Quaker Capitalism’. Some succeeded, others failed, and some turned into the very thing they once fought hard against. Yet through this intricate historic journey, I am left challenged by what they dared throw into a debate that carried the same fears and hopes we now have today. We so desperately need to break out of a fear that everything will collapse if we dare to think another way. Collapse is not necessarily a bad thing, because in its rubble green shots of life are more noticeable. And if we think that utilities and energy frameworks operate best when controlled by shareholder wealth or individual profit, then surely we are missing something about the very connection it has to the land we live and breathe. I have a fascination with the life of the 17th century poet, writer and theologian Richard Baxter. Born in 1615, his childhood education was mixed with the atmosphere of political and faith-led debate. His family regularly held meetings for people that wanted to explore ideologies concerning justice and the expression of belief. Years before the English Civil War and the rise of Oliver Cromwell, Baxter was already being exposed to the varied arguments that were brewing across the land. 'a dying man to dying men'. The division he noticed during the conflict, as both sides used increasingly aggressive tactics under the name of God to win their argument, provoked him into seeking ways of tackling intolerance. It was a decision that carried deep consequences. Not only did he upset some around Cromwell as he delivered a sermon to the ‘Protector’, highlighting that his role was nothing more than the king in masquerade, but he also found himself marginalised when the monarchy was restored a few years later. Continued debates raged in the country, as opposing religious factions each blamed the other for causing a utopia to be lost before it was truly gained. As the established church attempted to find ways of safeguarding positions post the return of King Charles 2nd, (due to some of their involvement in the removal of his father), an idea was implemented that only furthered division within the faith. The Clarendon Code demanded that the Book of the Common Prayer was to be compulsory. It also required all to swear an oath of allegiance to the king, made it unlawful for people to gather for worship that was not state authorised, and restricted non-conformist ministers from preaching or teaching in schools. Baxter fought vehemently to change the code, but failed, and his attempt of bridging the gap between different expressions of the faith became more difficult as the code was enforced. The years that followed saw persecution, oppression, confiscation of his books and possessions, criminal charges for writing a paraphrase of the New Testament, and imprisonment for holding a Conventicle (unofficial worship meeting). Through it all he remained steadfast in his pursuit of encouraging people to walk in unity. The passing of the Toleration Act in 1689 gave him a couple of peaceful years before his death in 1691. On a winter’s day in December 1691, he was buried in the sight of established clergymen, dissenters and non-conformists. These opposing groups had battled in recent years, yet on that funeral day they gathered together around the grave of a man who had worked tirelessly to persuade them to stand side by side. "I was a pen in God’s hand, and what praise is due a pen?" "stained his study walls with a praying breath". The third, it’s the story of two people the following century who both pursued their callings for transforming society through the Gospel message, yet found disagreement with each other in so many ways. John Wesley and George Whitefield had an erratic partnership that sometimes meant silence between each other for long periods of time. Yet no matter the distance or disagreement in theology, they walked a path of unity and respect that contributed to a diverse revolution within both the UK and USA. There are many suggestions of how they did it, particularly through such heated disagreements, but I don’t think it’s a coincidence that they both spoke with deep affection concerning the writings of the same author. An author by the name of Richard Baxter. Sometimes The Myth Of Our Famed Characters Is Different To The Lives They Had Lived. After the death of John Wesley, John Pawson burnt an edition of a Shakespeare play that had been annotated by the famed preacher. It was decided that the reputation of Welsey needed to be preserved, and that the people shouldn’t know that he had given his time to activities outside of the work of Methodism. A funny side story that highlights that sometimes the myth of our famed characters is different to the lives they had lived. In September, 1905, George Cadbury (the famous philanthropist) delivered an address before the Trade Union Congress at Hanley. As a successful businessman he had been an ardent supporter of the trade union movement, both with his time and financial means. His belief in the importance that the voice of all workers should be heard and the equal rights of pay, gender and opportunity should be built into all business practice, led him to not shy away from the critique of many issues and polices of the day. And one of his favourite themes was land distribution. …and on this occasion he took as his theme the rating of land values and the recovery of the land for the use of the people. He showed how the evils of society sprang from the divorce of the people from healthy contact with and interest in the soil, and how the land had been filched from the community and its burdens transferred to industry; touched on the Jewish law of the Jubilee; showed how beneficent would have been the operation of such a law upon the development of this country, and asserted that the wounds of society would never be healed until the rights of the people in the soil were re-established. (you can read more about Quaker Capitalism in Revival’s Symphony). The issue of landownership and its relationship with the wounds of society is an interesting one, and seems a very relevant theme today as the graph below highlights. 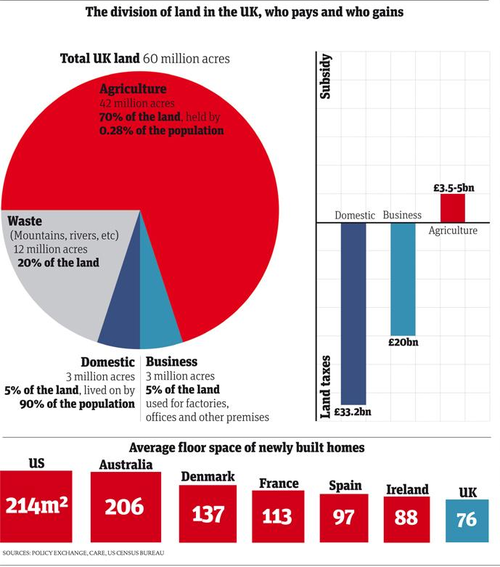 70% of the UK land is Agriculture, held by 0.28% of the population. 20% of the land is Waste (including mountains, rivers). 5% is Domestic which houses 90% of the population. The voice of George Cadbury continues to echo throughout our land. It wasn’t the easiest of moves, as it was surrounded by opposition, misunderstanding and financial challenges. This piece of land purchased on the 18th June 1878 held so much potential, but early work was hampered by bad weather and unforeseen struggles. By the time the first brick was laid in January 1879, the clay ground had become a sea of mud, with horses and carts struggling to transport materials to the building plots. Some mocked because of these setbacks, gloating that this grand plan would not be finished on time. But sheer commitment, long hours and obsessive belief in the cause, led to the moment in 1880 when two brothers stood in front of their first finished cottages. It was a monumental step for the confectioners Richard and George Cadbury. These were more than just a few buildings; this was a sign that the family dream could one day be realised. A couple of paragraphs from a chapter in Revival’s Symphony that explores a daring dream to translate the Quaker ‘advices’ into practical help concerning living conditions and quality of life for factory workers in Birmingham. the very streets … laugh in the face of crude conventionalism. The monotony of capitalistic housing with rows of all-alike houses is prohibited. Why, it is the very joy of life among the villagers. This report influenced another chocolatier by the name of Milton Hershey to invest his profits back into social investment. Bournville became an experiment that provoked governmental response, particularly with the positive results of living standards, health care and the effective use of land. This ongoing discussion led to a number of Garden Cities / New Towns to take shape. Whilst that journey led to mixed results, I am intrigued at one of the early ideas that shaped those explorations - that the ‘city’ should belong to its citizens in perpetuity (i.e. a fixed bond of ownership with no fixed end date). That once the cost of its development was paid back from the income raised within the location, any further profit from the value of land would flow back into the community. Decisions of investment were to be made from a local perspective, with active engagement and personal ownership. It was an idea that was eventually quashed in 1946, diverting local income back to the administration of central government. Regardless of our varied political stances concerning distribution of finance, the story of Garden Cities is a fascintating tale of creativity and imagination that I think we need to take heed of within these days. Where people of faith dared to face the tough challenges of injustice and sought to find practical means to not just address this issues but to eradicate them. Sadly, the ‘present day’ informs us that these issues still remain, yet as I wrote about the influence of what some would term ‘Quaker Capitalism’ I found myself both inspired and challenge. It was a history that morphed itself into a relevant and constant reminder - that this journey within the narrative of revival is one that demands imagination within the valleys of pain. Spend time reading letters, notes and journals of some of our most famous hymn writers of old, and you soon discover the gentle hints of what captures their heart and imagination. These gems of inspiration spark creativity and lead their sight upon something far deeper than the confines of what the iris detects. Miss Anne Steele (1726 - 1788) was a hymn writer that confronted the constant challenge of living an active hope in the midst of pain, struggle and disappointment. Her blend of life’s reality struck a chord for many people, and brought the Gospel message in a tone that echoed the footsteps of pilgrims of all ages. I enjoy a calm evening on the terrace walk, and I wish, though in vain, for numbers sweet as the lovely prospect, and gentle as the vernal breeze, to describe the beauties of charming spring; but the reflection how soon these blooming pleasures will vanish, spreads a melancholy gloom, till the mind rises by a delightful transition to the celestial Eden - the scenes of un-decaying pleasure and immutable perfection. It never ceases to amaze me the intricacy of wonder that resides within a creation that I so often pass by in quick step. The ever moving second hand of my watch informs me of my next meeting and rendezvous, the exciting and so easily accessible applications on my phone tempt my attention to focus upon their instant wonders and news feeds. Yet this created world carries a beautiful tapestry of the ‘now’ and ‘future’; of a present work of art from the Craftsman and an ongoing masterpiece that is only glimpsed through a veil and misty window. A carefully placed comma in our lives invites us to take a breath and consider what truth is being declared before us - and I just wonder whether the hymn writers of old remind us that one of those commas is creation itself. A display of God’s wonder that draws our gaze past our own self-created world and onto a glorious kingdom that is both at hand and just coming into sight.